SAN FRANCISCO--(BUSINESS WIRE)--Twitch, the leading social video platform for gamers, and Sony Pictures Entertainment has attracted an impressive number of Evolve gamers for The Chappie Challenge, a one-of-a-kind event. This program will mark the first time that human gamers can play against a movie character, as players compete in 2K and Turtle Rock Studios’ Evolve against Chappie, the star of Sony Pictures Entertainment and MRC’s Chappie, in theaters March 6. Evolve is a highly strategic experience in which a team of four human players fights a fifth, playing as a Monster. 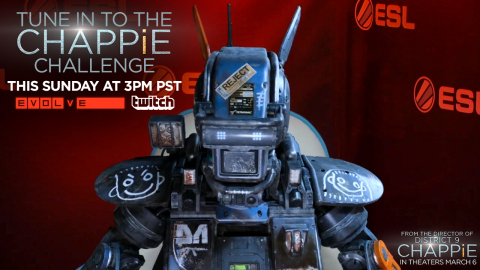 In the Chappie Challenge, a team of human gamers will have the chance to square off against Chappie on Twitch. The qualifying rounds ran over the weekend of February 21-23; the finals match against Chappie is slated for March 1 starting at 3pm PST. The live finals will take place at ESL studios in Burbank, California, where ESL is overseeing tournament production in conjunction with Twitch. At this event, the top team will face off against Chappie. This match will be livestreamed on Twitch at www.twitch.tv/evolvegame, and marks the first time a film character has competed in character on the platform. From Neill Blomkamp, the director of District 9, comes the new film Chappie. In the near future, crime is patrolled by an oppressive mechanized police force. But now, the people are fighting back. When one police droid, Chappie, is stolen and given new programming, he becomes the first robot with the ability to think and feel for himself. As powerful, destructive forces start to see Chappie as a danger to mankind and order, they will stop at nothing to maintain the status quo and ensure that Chappie is the last of his kind. Directed by Neill Blomkamp. Produced by Neill Blomkamp and Simon Kinberg. Written by Neill Blomkamp & Terri Tatchell. As Chappie’s intelligence and emotions evolve throughout the film, there is a different kind of evolution happening in the video game Evolve. From 2K and Turtle Rock Studios comes Evolve, the highly anticipated shooter in which four Hunters face off against a single, player-controlled Monster in adrenaline-pumping 4v1 matches. Play as the Monster to use savage abilities and an animalistic sense to kill your human enemies, or choose one of four Hunter classes (Trapper, Support, Assault and Medic) and team up to take down the beast on the planet Shear, where flora and fauna act as an adversary to man and Monster alike. Level up to unlock new Hunter or Monster characters as well as upgrades, skins, and perks. Earn your infamy on the leaderboards and become the apex predator. Evolve is currently available for Xbox One, the all-in-one games and entertainment system from Microsoft, PlayStation®4 and PC. For more information about the Chappie Challenge, visit http://www.chappiechallenge.com/. Twitch is the world’s leading live social video platform and community for gamers. Each month, more than 100 million community members gather to watch and talk about video games with more than 1.5 million broadcasters. Twitch’s video platform is the backbone of both live and on-demand distribution for the entire video game ecosystem. This includes game developers, publishers, media outlets, events, user generated content, and the entire esports scene. In February 2014, Twitch was ranked the 4th largest website in terms of peak internet traffic in the U.S., fortifying the brand as an entertainment industry leader and the epicenter of social video for gamers. For more information visit: http://www.twitch.tv/p/press and the Twitch blog. Founded in 2005, 2K develops and publishes interactive entertainment globally for console systems, handheld gaming systems and personal computers, including smartphones and tablets, which are delivered through physical retail, digital download, online platforms and cloud streaming services. 2K publishes titles in today’s most popular gaming genres, including shooters, action, role-playing, strategy, sports, casual, and family entertainment. The 2K label has some of the most talented development studios in the world today, including Firaxis Games, Visual Concepts, 2K Marin, 2K Czech, 2K Australia, Hangar 13, Cat Daddy Games and 2K China. 2K’s stable of high quality titles includes the critically acclaimed BioShock®, Borderlands™ and XCOM® franchises, the beloved Sid Meier’s Civilization series, the popular WWE 2K franchise and NBA 2K, the #1 rated and #1 selling basketball franchise*. 2K is headquartered in Novato, California and is a wholly owned label of Take-Two Interactive Software, Inc. (NASDAQ: TTWO). For more information, please visit www.2k.com. *According to 2008 - 2014 Metacritic.com and The NPD Group estimates of U.S. retail video game sales through January 2014. Twitch and Sony Pictures Entertainment are hosting the Chappie Challenge where gamers compete in Evolve for a chance to win $15K and to play against the movie character Chappie live on Twitch.